"The Peanut Butter Chocolate Stout has a huge following and anytime it’s not on tap people are upset," says Tori Bacheller. For our latest profile, meet Tori Bacheller, the founder, co-owner and head brewer of a company that’s brining West Coast vibes right on over to Londonderry, New Hampshire. Pipe Dream Brewing Company is a spunky 40,000-barrel-per-year operation that slaps eccentric flavors as well as surf-inspired graphics and an edgy style right on the table. Read on to learn more about their popular Peanut Butter Chocolate Stout and other fan favorites. 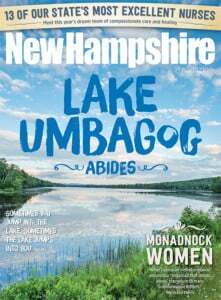 New Hampshire Magazine: What is your title at the brewery? Tori Bacheller: Founder, co-owner and head brewer. TB: I was stationed in California while in the Marine Corps. While out there, a buddy and I thought we would save money if we brewed our own beer, which wasn’t true, but I fell in love with the process! I started home brewing in California and then continued to do so when I moved back to New Hampshire. I met my business partner, Jon Young, three years ago and we opened up Pipe Dream. TB: I was born and raised in New Hampshire; my whole family is here and family is everything to me. The craft beer scene in New England is growing at a rapid rate but when we opened Pipe Dream two years ago, there weren’t many other craft breweries in Londonderry/Derry. It’s a great town to be a part of. It’s awesome to see other craft breweries succeeding and creating a beer culture here. Anything that includes wild fermentation. Wednesday and Thursday: 12-8 p.m.
Friday and Saturday: 12-10 p.m.
Our Funkin’ Sour Stout. It’s wild fermentation at it’s best. NHM: What’s your annual production size, in barrels? TB: We opened on May 22, 2016. It was definitely a crazy process but it’s been amazing! We never thought we would grow this fast. TB: We are a veteran-owned business that hosts a lot of charity events here at Pipe Dream. We have a West Coast vibe to tie in Jon’s experience in California, so we love the open concept feel — a little industrial meets California. Families are welcome and encouraged here. Anytime parents come in without their kids, we’re always bummed because we want the kids to come too! We are also one of the only dog-friendly breweries in our area, which is amazing. TB: We have between 11 and 15 beers on tap at all times. Jon is a huge believer in variety, which we all support and agree with. We want someone to try a little bit of everything, and we know not everyone is going to love hoppy IPAs. TB: Oh boy, we have a couple now. West to East IPA is our flagship and the first beer we brewed here at Pipe Dream. It’s one of Jon’s first creations. Mango IPA is a great summer beer, as well as our Blood Orange and Hue Heffy. The Peanut Butter Chocolate Stout has a huge following and anytime it’s not on tap people are upset. We also do a fantastic sour program here — Pop That Sour is our sour series with lots of fruit. TB: We currently are in the process of creating another taproom/private event room. We have already expanded the brew system from a 2.5-barrel system to a 15-barrel system in just a year and a half. TB: We are in over 150 locations and the full list can be found on our website.